Quick answers for retailers and brands. Buy Local Now™ is a real-time product sourcing technology provided by SmartEtailing that connects ready-to-buy consumers on brand websites with local stocking retailers. A Buy Local Now™ button on a brand's website shows consumers immediate local availability and guides them to make a purchase from a local retailer. This page answers questions for retailers and brands about this powerful service. What's the difference between Buy Local Now™ and the store locator on a brand website? The typical brand's store locator is found in another part of their website, often several clicks away from the product(s) being viewed. Also, most store locators are compiled with no knowledge of current inventory and with no easy way for individual retailers to keep their own listings current. Buy Local Now™ buttons go directly on the individual product pages so the list of local stores and their inventory status appears in a pop-up layer over the product page while it is still being viewed. And, Buy Local Now™ results are updated as often as every 15 minutes, 24/7. This rewards consumers by telling them where they can buy the product locally right now, keeping your local store relevant in today's competitive marketplace. I’m already a SmartEtailing client - am I automatically enrolled in Buy Local Now™? Clients of SmartEtailing who already use our POS Sync options are automatically included in Buy Local Now™ in-stock referrals at no extra cost. Clients already using our Supplier Sync option are automatically included in Buy Local Now™ in-warehouse referrals at no extra cost. Clients at any level of service can elect to add the POS Sync and/or Supplier Sync options for gaining Buy Local Now™ in-stock and/or in-warehouse referrals. Can I participate in Buy Local Now™if I don’t have a SmartEtailing website? YES! All local specialty bike retailers can register for a free Buy Local Now™ account. SmartEtailing is committed to the health and profitability of the specialty retail channel and we believe that Buy Local Now™ can make a meaningful impact on your store's bottom line. How much does it cost to report store or supply-chain inventory to SmartEtailing? This service is FREE. Retailers with a SmartEtailing website who already use our POS Sync and Supplier Sync options are automatically included in Buy Local Now™ referrals. You don't need to have a SmartEtailing website to participate. All local specialty bike retailers can register for a Buy Local Now™ account to self manage the store listing. In addition, stores may elect to enroll in our POS Sync and/or Supplier Sync options in order to gain more referrals based on in-stock and/or in-warehouse inventory availability. Does SmartEtailing take a percentage of any sales resulting from Buy Local Now™? No, never. All transactions occur between consumers and their chosen local retailers, often taking place in the stores, though online sales are also possible (when permitted by the brands). Why is Buy Local Now™ free? Buy Local Now™ was created by SmartEtailing to assist consumers in buying through local specialty stores more often. If Buy Local Now™ helps keep the local specialty channel vibrant and profitable, then there are more healthy retailers who can consider other services we offer. If I don’t sell online, can I still report inventory to Buy Local Now™? Yes! Whether or not you use SmartEtailing's online catalog option, you can report store and supply-chain inventory. If you happen to be using a SmartEtailing catalog and your included shopping cart is enabled, then the link will say "Buy Now" in the listing and will take a consumer to that exact item in your catalog. If your shopping cart is disabled, the link will say "View Site" yet will still go to the exact item. What POS systems work with SmartEtailing and Buy Local Now™? SmartEtailing's POS Sync tool is built-in to all of the most popular POS systems used by bike retailers. At the bottom of the SmartEtailing POS Integrations page is a link to the POS Sync integration document that we freely give to any non-integrated POS provider. POS integration is the best option since it automates the inventory reporting. However, even without POS integration, a tech-savvy webmaster can still use POS Sync to report inventory manually at specific intervals. And stores without a POS system or that are challenged by store data reporting can still consider reporting through one or more supplier partners. My store isn’t showing on Buy Local Now™ for a brand I carry - how can I fix this issue? That's easy. Just submit your request for your free listing and we'll add you within three business days once we confirm your store with a trusted supplier. What if my information in the Buy Local Now™ listing is not accurate? Thanks for helping us keep the Buy Local Now™ listings current and accurate. For correcting errors in your own listing, simply submit the online form to claim your listing after which you can easily keep it up to date entirely on your own. For errors in your listing or with other listings, please notify us of the problems by contacting SmartEtailing Support. We'll investigate and make the necessary changes. How is the dealer listing order determined on brand websites? There can be up to three listing sections in Buy Local Now™ results shown to consumers. The uppermost section lists nearby stores with the specific item in stock. A second section can display to show additional local locations that, even though the item is not currently in the store, can quickly obtain it from one or more warehouses. The third section lists known local stores that are not yet reporting store and/or warehouse inventory yet may be familiar to the consumers. It's up to the consumers to decide where they will go after seeing the Buy Local Now™ results. Within each section, standard geo-location technology is used to list the approximate distance of each store from the specific locale being searched. Buy Local Now™ maps and the corresponding lists also change in real time when the map is zoomed in or out for the selected area. What happens to the inventory data I supply to SmartEtailing for Buy Local Now™? Data submitted to SmartEtailing by retailers is used solely for the benefit of each reporting retail location to encourage local purchases. The data is never shared or otherwise used for any purpose for which the retailer has not given advance permission. Should I participate even if some of my primary brands don’t participate? Even if your store only carries some of the brands using Buy Local Now™, you can make sure your store appears on the listings for your area when local consumers click on a Buy Local Now™ button in one or more of the websites. It's free, and you're never required to report local inventory using the available fee-based options. Since Buy Local Now™ is free for any specialty brand to use, you can also encourage the brands important to you to join. Please send the brands you work with a link to the Buy Local Now™page on our website to learn how this service can work for them. Can Buy Local Now™ tell me which brands are directing referrals to me? For clients of SmartEtailing, if a consumer is referred from a Buy Local Now™ brand and decides to continue with the purchase at your website, the referring brand will automatically appear in the "affiliate" field when you view the order. SmartEtailing can assist any reporting retailer, including those not using our catalog options, on easy, free ways to measure brand referrals through Google Analytics. How much does it cost my brand to use Buy Local Now™ in our website? The standard Buy Local Now™ tool is free. There's no cost for any specialty bicycle or bike accessory brand to add Buy Local Now™ to its website. SmartEtailing developed Buy Local Now™ to help all specialty suppliers and their local partner retailers offer viable, relevant alternatives where consumers can get in-person service, fitting, assembly, installation and ongoing support. We do offer an enhanced option called Buy Local Now™Pro which has a cost associated with it. If you are a cycling brand interested in this option please contact our brand partnership team to learn more. No. All transactions occur between consumers and their chosen local retailers, often taking place in the stores, though online sales are also possible (when permitted by the brands). Are there any requirements for using Buy Local Now™ on my website? There's only one requirement for a brand to have the Buy Local Now™ app find local stocking retailers: Each model and related variations (SKUs) that will display a Buy Local Now™ button must be associated with a registered GTIN (UPC). This is what connects the items to real-time availability at each reporting local retailer through the various POS systems used by the stores. GS1-US can explain GTINs (if you don't already use them). Can a Buy Local Now™ button be added in addition to my "Add To Cart" button? Buy Local Now™ can easily co-exist with any other purchase option at a brand's website. Sometimes brands choose to offer direct sales or have other reasons for having another form of online shopping. If it makes sense in the brand's overall online strategy to continue using such tools, there's no reason the brand can't also adopt Buy Local Now™ to give consumers the choice and to reward local, stocking specialty retailers. Does adopting Buy Local Now™ mean I have to ship directly to consumers? Not at all. Because the sales are handled by each retailer, along with before- and after-the-sale service and support, Buy Local Now™ simply helps you and your partner retailers be more successful with how you already work together. How do we add retailers that carry our products to Buy Local Now™ results? Any local bike retailer can register for a free listing. Just ask them to submit a completed registration form to SmartEtailing. We'll handle it from there. How does Buy Local Now™ know which retail locations are authorized to sell our brand? Brands with controlled distribution, for some or all products, can provide SmartEtailing with the official list of approved retailers as well as more details regarding how restrictions apply. In such cases, the Buy Local Now™ app only refers to the list of pre-approved retailers. When changes occur that add or remove approved retailers, it's easy for the brand to give SmartEtailing an updated list. What are the steps involved for getting our brand's website ready to use Buy Local Now™? It's a very simple process. We assign your brand a set of unique IDs along with a snippet of code that makes the Buy Local Now™ app work. You decide which item pages in your website should display a Buy Local Now™ button. Someone on your IT/Web team follows our instructions for adding the code snippet to the selected pages. We help you test it and, unless there are any adjustments required, you're done and ready to display the Buy Local Now™ buttons for consumers to use. Does Buy Local Now™ work in other countries in addition to the United States? Buy Local Now™ also works in Canada (including in Quebec), though only if the brand is displaying Buy Local Now™ buttons on the pages it shows to Canadian consumers. SmartEtailing is encouraging brands to either display the same website in the US and Canada or to be certain to add Buy Local Now™ buttons on the product pages displayed in Canada. Buy Local Now™ can be adapted for other countries as well. For now, SmartEtailing is focused on growing brand and retailer use in the United States and Canada. How can I obtain a report of the consumers that are redirected from my Buy Local Now™ button so I can learn more about sales potential? A reporting module is being developed to help individual brands privately and confidentially track key activity and sales metrics when referrals are made from the brand's website. For immediate tracking, brands can also use Google Analytics to measure when consumers click on a Buy Local Now™ button on any product pages. We are actively engaged in the process of continuously improving the reporting capabilities of Buy Local Now™ to deliver brands an effective dashboard for determining local sales generated by brand referrals. At my brand's website, I want to have more control over the listing order and want to convey other attributes related to how retailers are listed. Can this be done? Yes, in addition to our primary Buy Local Now™ services (hosted by SmartEtailing), we also offer a version of Buy Local Now™ that can be hosted and controlled by a brand. There's no cost from SmartEtailing to access this option including instructions and testing. There will be direct costs including planning, programming and hosting. These costs are the responsibility of any brand choosing this option. Why do I need to submit my product descriptions, images and specifications to SmartEtailing for inclusion in its Catalog Library as part of Buy Local Now™? Buy Local Now™ can function as an improved store locator even without including products in SmartEtailing's Catalog Library. The advantage to being in SmartEtailing's Library is that this helps stocking retailers automatically display a richly merchandised product presentation that's directly linked to that retailer's listing in the Buy Local Now™ database. Since SmartEtailing's online catalog is used by over 1,000 retailers in the United States and Canada, inclusion in our Catalog Library helps Buy Local Now™ work even harder for your brand and your retail partners. I've seen some stores are listed with items "in warehouse" on Buy Local Now™ versus having the items in their local inventory? There's a related service developed and offered by SmartEtailing called Supplier Sync. This service adds real-time supply-chain inventory to the Buy Local Now™ results in order to keep more of a brand's items visible and available beyond what normally is stocked by local retailers. Many of the industry's top distributors and retailer-direct brands already are enrolled in the Supplier Sync service. If your products are already distributed by one or more of these firms, once your items are entered in SmartEtailing's Catalog Library (for free) then in-warehouse listings will also show in your Buy Local Now™ results. If you are interested in learning how you can report your own warehouse inventory using Supplier Sync, please contact our brand partnership team and we'll explain the program to you and review any costs associated with it. Why would I want to include my warehouse inventory in the Buy Local Now™ results? Doesn't that discourage local retailers from stocking as many of my items? 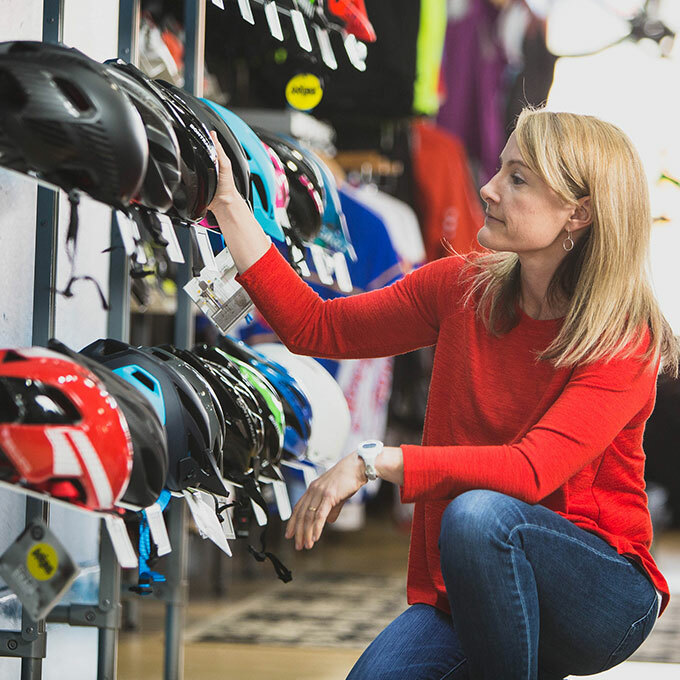 Most local specialty bike stores have limited floor and shelf space, limited on-site storage space and limited open-to-buy inventory dollars. If your brand has many product models available, it's really not possible or even sound business practice for such stores to carry all of your products even some of the time. Yet today's consumer isn't likely to ask "Can you get this for me?" if they don't see it available in the local store's website. Supplier Sync uses "endless aisle" technology to keep more of your available items visible more of the time in more locations. This makes it more likely you'll see more sales and replenishment purchases and you'll also help store buyers spot interesting products that they may have previously overlooked or discounted. Get started with Buy Local Now today!